Month-over-month, we can see 4,600 fewer people either working or looking for work (a decrease in the labour force) between February 2019 and March 2019. There were 3,700 fewer people in full-time employment and 11,200 fewer people in part-time employment in March compared to February. Compared to this time last year, March 2019 reports 3,000 fewer people with employment than was observed in March 2018. This change was largely attributed to decreases in part-time employment. Specifically, March 2019 saw 2,500 more people employed in a full-time capacity than was observed in February 2018. With respect to part-time employment, there were 5,500 fewer people employed in a part-time capacity in March 2019 than in March 2018. Niagara’s unemployment rate increased from 7.0% in February 2019 to 7.3% in March 2019. This increase occurred alongside the month-over-month employment rate decreasing from 55.6% to 54.1%. Niagara’s labour market participation rate also decreased from 59.8% to 58.4%. In an ideal state of affairs, we would see decreases in the unemployment rate with increases in the participation and employment rate. Table 2 shows that there were 2,700 fewer people employed in Niagara between February and March 2019, which follows the trend seen in the unadjusted data. When we look at the unemployment, participation, and employment rates, the month-over-month adjusted comparisons also show some similar trends compared to the unadjusted figures. The adjusted data indicate that the unemployment rate fell from 6.8% to 6.6%. At the same time the employment rate decreased from 56.6% to 56.0% and the participation rate decreased from 60.8% to 59.9%. Given some of the differences between the adjusted and unadjusted datasets, one might ask which of these figures is correct and/or should be used when reporting these statistics. The answer is that both are equally valid. Both measures are essential tools to understanding labour force trends in Niagara. In this case, these trends would suggest that even when compensating for predictable and seasonable factors (e.g. expected and historical seasonal slowdowns in Niagara’s economy) we still see fewer people in employment, but also fewer people seeing work. This rather unique state of affairs, invites some additional context. Recognizing that there were no major employer closures that would offer the easiest account for the decreased employment in Niagara, and that the adjusted data shows fewer people actively looking for work, it is possible there is a demographic explanation for some of the changes in March’s labour market indicators. 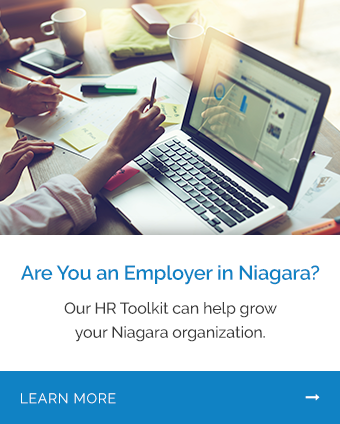 When employment figures are broken down by age group, we see that 2,300 of Niagara’s 5,000 employment exits between February and March were among people age 55 to 64. At the same time, the number of people age 55 to 64 who reported being neither employed nor looking for work in March of 2019 increased by 2,000 compared to the previous month. These data suggest a trend that is indicative of retirements or some other employment exit that did not immediately result in individuals seeking employment. If Niagara were experiencing large-scale job losses as the cause of the decrease in employment, the data should show similar increases in unemployment. As seen in tables 1 and 2, those increases did not occur. Here we see 1,800 fewer youth working in March compared to January. There were 2,000 fewer youth working in a full-time capacity, and the number of youth working in a part-time capacity increased by 200. March saw the youth unemployment hold steady at 11.2%, despite the employment changes. The participation rate decreased from 62.9% to 62.3%. Similarly, the employment rate decreased from 55.9% to 55.3%. Compared to this time last year, March 2019 reports 6,000 more youth employed in a full-time capacity and 1,100 fewer youth working in a part-time capacity. Similar to the general labour market data, the scenario for youth does not suggest an increase in youth joblessness. Despite 1,800 fewer youth reporting employment, there was a decline in the month-over-month number of unemployed youth. Month-over-month job losses would produce an increase in both the number of people reporting unemployment and the overall unemployment rate.